The film studios of Paramount Pictures in Hollywood are usually a stage for box office top hit movie sets, this holiday weekend, however, they became a heaven for foodies and wine lovers. 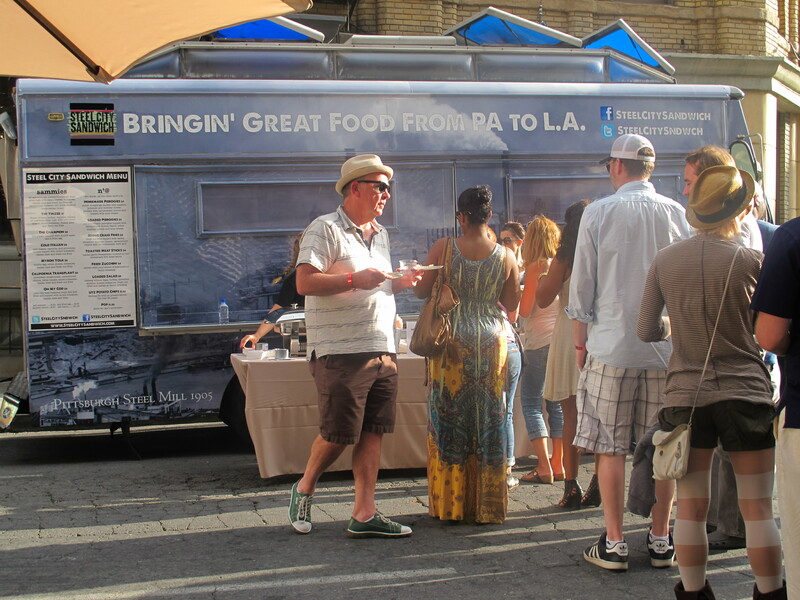 The Taste of LA is already an established festival of great food and drinks on the LA’s gourmet scene. What is more, since Los Angeles is the world hub of entertainment, there could have never been a dearth of stars guiding visitors through cooking master classes, wine tastings and tutorials on the event. An event which struck my eyes the most was called ‘Bling vs. bargain’. An attractive name on its own, who would not like bargains? In this case we were comparing cheep and pricier wines in terms of taste. 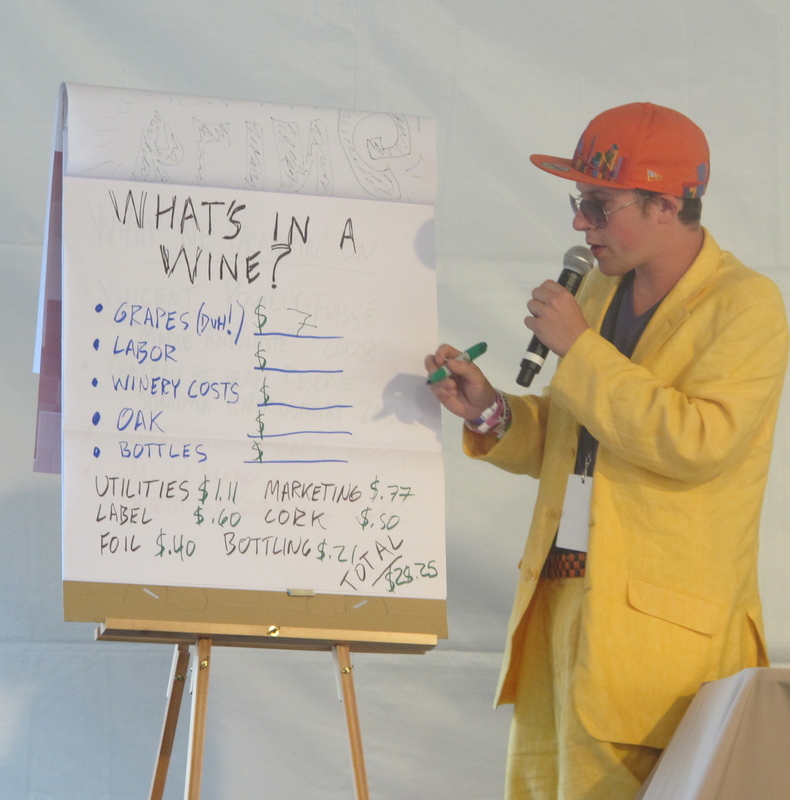 Moderated by a ‘rap star’ Justin Warner, co-chef/owner of Do or Dine in New York, it was an edgy and unconventional tasting enjoyable for anyone wary of stuffy wine events. Warner brought a stylish twist into the hunt for bargains. He started up with a song, which he composed himself. Below is a sample of his rapping to heat us up for the challenge. It is a version of the famous New York song “Empire State of Mind” by Jay-Z and Alicia Keys, renamed by him ‘Alsace‘ and it is really incredible! The elements of the cost for a bottle of wine. Interestingly, the fans of each wine were usually split in a half. One part of the tasters preferred a Californian Chardonnay to a French Pouilly Fuisse from Burgundy and the other did the reverse. Same applied to a Sangiovese based red wine from California versus Chianti from Italy – one preferred a youthful and less tannic New World version and another the Old World staple. Loads of amazing street food from tacos, burgers, delicious sorbets to super healthy vegan sandwiches and spicy chicken Peruvian tortillas seduced folk of all ranks from groovy gay community through moms with daughters to fancy LA girls and guys. Really a spectacle. I recommend taking your bite, sitting on the stairs of one of the Paramount buildings and just watching what is happening around you. Looking at faces of happy diners you can encode which food truck makes the tastiest think so you can save time standing in all the queues (lines) and just go straight to the approved ones. Californian wines are known for their dominant oaky aromas. However, the old truth says that we should not be mislead by generalizations. In this case, not all the wine makers in California use the same methods. One of the examples is Simply Naked range under the wings of the US-based Constellation brand producing fruit driven wines fermented in stainless steel instead of oak. All of the samples were packed with fruit aromas in such an intensity, that I thought it was a grape juice. My taste buds were deceived but the over 12 % content of alcohol stated on the label was not a joke from the producers, but a reality. So, beware and do not drink the entire bottle on your own during an afternoon! Their Merlot was my favorite. Its purity appealed to my red fruits loving palate. This tasting was an interesting discovery, nevertheless, I will still remain to be a fan of a gentle touch of oak in my red wine, with the whites it depends in what mood I am at the moment. After all each of us likes his/her wine in a different fashion. One likes it simple another complex as it is sometimes with human relationships – an Italian and French might like a complex affair, an American may prefer it simple and straightforward. Any objections? Wine and music? A perfect couple – at least according to a musician and proprietor of Gargiulo vineyards Jeff Gargiulo. His Italian roots manifested themselves in his tomato plantation and a beautiful vineyard. Now he can feel like at ‘home’ in Napa. He even played some rhythms on his guitar and sung for us. Don’t worry I am not singing, just smiling and enjoying the perfectly ripe atmosphere surrounded by vines and superb tones. I interviewed a passionate proprietor of the Martin Estate Greg Martin about his Cabernet Clones and his own ‘Chateau d’Yquem‘. Did it measure up to this top Sauternes? Watch this video and you will find the answer (according to my palette). Owned by a family with Argentinian roots, this winery is a state of the art operation where sophisticated wine making techniques such as using of gravity ensure that the Palmaz wines are capable of competing with the world’s top wines from the Old World. I talked to Florencia Palmaz, one of the proprietors, about her Argentinian family endeavour in winemaking in Napa. The skilled hand of our cameraman Fernando Orozco captured all corners of this fascinating winery. The innovative Chateau Palmer has even its own sing for the 2009 wine release. How creative! HEAR PALMER 2009 – Ch�teau Palmer – Primeurs 2009.